A single mom of many sweet loves and teacher to bunches of other mother's loves. Art and History are my favorite subjects. I am re learning our history right along with the kids and LOVING all the great opportunities that the internet and Ipads offer us. I gather my favorites and post them here because I have so many more kiddos to teach I might as well have my lesson plans online! The internet world is ever evolving and changing. PLEASE preview all links on my page before sharing them with your children. And be sure to share them with friends! 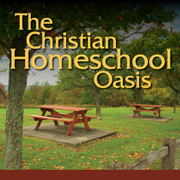 Interested in discussing a wide variety of homeschool-related topics with other passionate homeschooling parents? Check out THE CHRISTIAN HOMESCHOOL OASIS (CHO), the new home of the Facebook group born in conjunction with this database project in March, 2013.